The time structure for Torpor included 2 layers of repetition that were inspired by cycles of dormancy in bears. Bears are most active during twilight hours, so the performance occurred during Dawn and then repeated at Dusk on the same day. Within the sunrise and sunset times, there is additional time structure that is similar to other iterations of Pace Investigations. 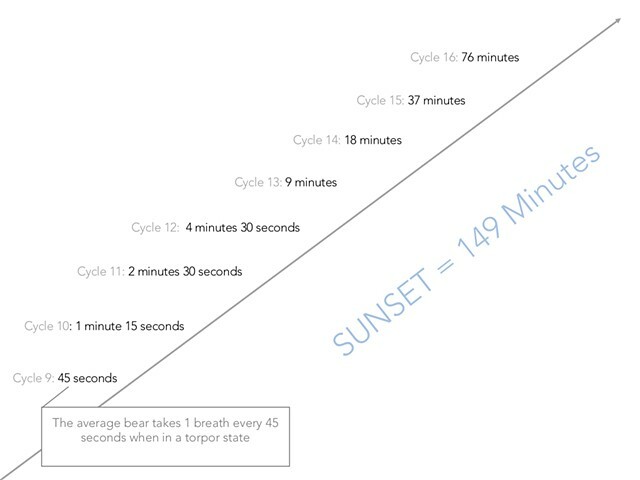 During sunrise and again at sunset the performance repeats 8 times, its duration either increasing or decreasing. This is meant to mimic the shift in average heart and breath rate bears experience as they enter and exit torpor.